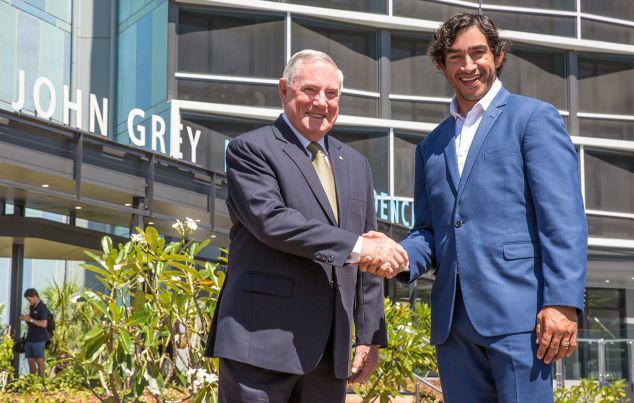 Rugby League legend and JCU Honorary Doctor, Dr Johnathan Thurston, did the honours today – officially opening the new student accommodation at James Cook University in Cairns. The building, with accommodation for 300 students in its first stage, has been named the John Grey Hall of Residence in honour of former Chancellor Lt Gen Dr John Grey (Rtd) AC. Lt Gen Dr Grey was Chancellor of JCU for 17 years – from 1999 to 2016. He was awarded an Honorary Doctorate of the University in 2016, in recognition of his exceptional and exemplary service to JCU. Johnathan Thurston was awarded one of the University’s highest honours, an Honorary Doctor of Lettersin 2015, in recognition of his outstanding community service, including his tireless efforts to encourage young Indigenous Australians to pursue education. Current JCU Chancellor, Bill Tweddell, said on-campus accommodation offered students many advantages. “For international students, and those who relocate to Cairns from elsewhere in Queensland and across Australia, this is an opportunity to live in a supportive environment on a beautiful campus, just minutes from classes and the library,” he said. The John Grey Hall of Residence was designed by Wilson Architects and built by ADCO Constructions. The $40 M project provides rooms for 300 students, and has the capacity to extend to beyond 1,000 beds as the campus grows. The first residents moved into the John Grey Hall of Residence on Friday (16 February) just in time for the beginning of classes on Monday (19 February). The seven-storey, octagonal building offers residents a choice of studio apartments, shared apartments with en suite bathrooms, and six-bedroom apartments with shared bathrooms. Information on the John Grey Hall of Residence is available at www.jcu.edu.au/accommodation.